On our 66 mile (106.6 km) drive today we continued though spectacular mountain scenery and round more sharp corners to our final destination, Mai Hong Son. This remote, small town is just a few kilometers from the Burma border in the far northwest of Thailand – but more about that later. We made our first stop at a Scenic Lookout and were greeted with superb views of mountains on both sides of the road. As an added bonus for Bill, an old Mustang rally car was parked there and he learned that the Spice Road Classic was passing through this area! The Rally, open to Vintage and Classic cars before 1970, started in Cambodia and would end in Myanmar (Burma). Unfortunately, no other cars came by during our brief stop. 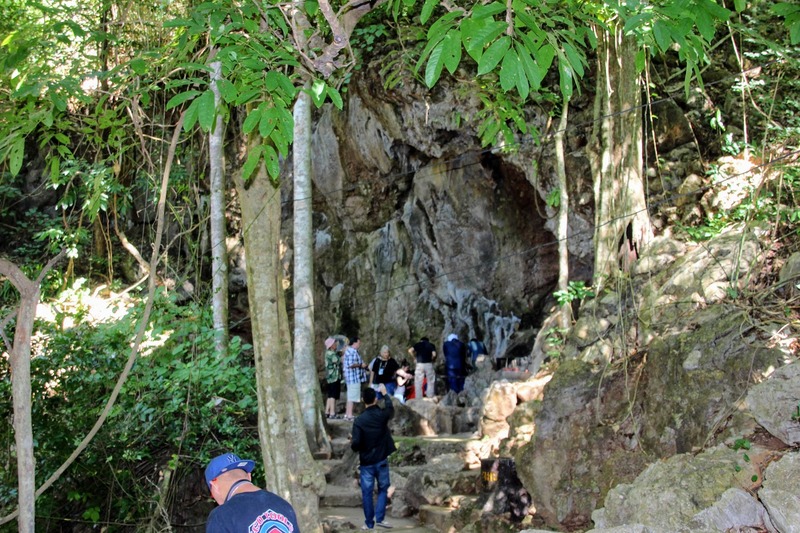 Some 10 miles from Mae Hong Son we arrived at a Fish Cave located in Tham Pla–Namtok Pha Suea National Park. 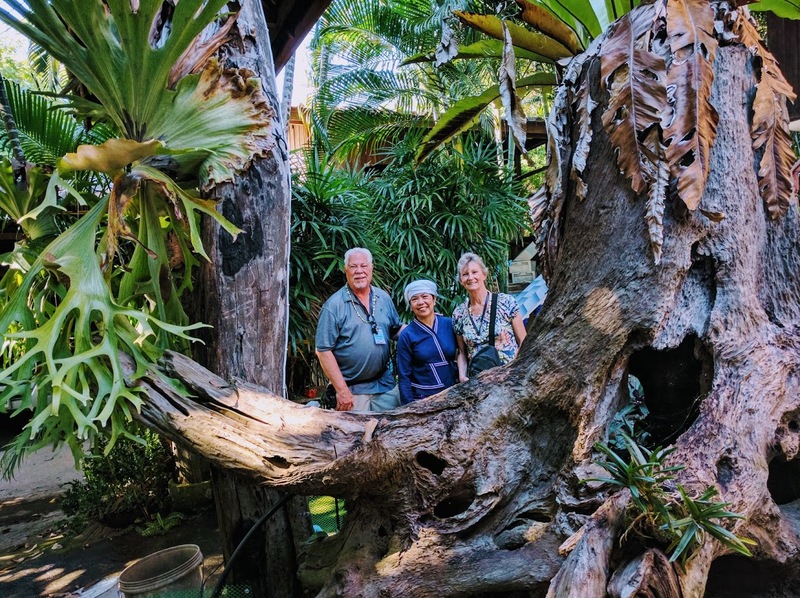 The tree-shaded grounds of the Fish Cave are beautifully maintained and we enjoyed our cool walk along the river to the cave. The fish are a deep blue brook carp and are left unmolested due to being revered by the people. In fact, all the fish looked huge … thanks to the people buying food and feeding them! Refreshments for visitors are available at several food stalls and restaurants at the entrance to the Park. It was a pleasant stop. 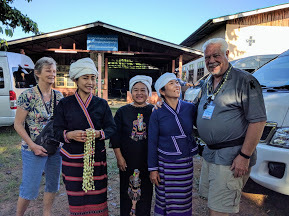 Today featured a wonderful mixture of Thai culture, a medical “Resort”, beautiful plants, breathtaking landscapes, and an amazing journey across the mountains of northern Thailand to the town of Pai. Surprisingly, we weren’t the last of our group to show up at the 6:30am breakfast! Bill is definitely not a “morning” person! 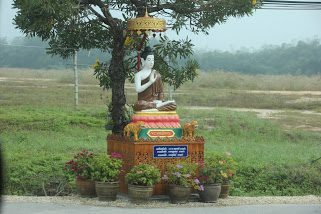 An hour later we headed back towards Lamphun for our first experience of a Home Stay village at Huay Sai Kaw. 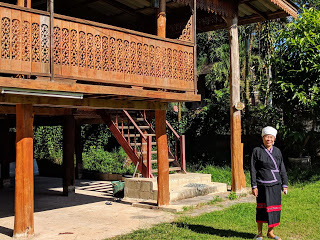 We were greeted by smiling, traditionally dressed women, who offered us garlands of jasmine and served herbal teas for detox, back pain and energy. The tea was delicious and we’re sure if we drank more of it we would experience the promised results. The daughter of the Village Chief gave a presentation explaining that at one time this area was covered in lush teak forests, however, excessive logging resulted in deforestation, erosion and landslides. Several years ago a Restoration Project was developed and the land began to recover. Dams were built to conserve water and prevent flooding and 5 years ago the Village was awarded the Green Global Trophy from the Princess of Thailand. 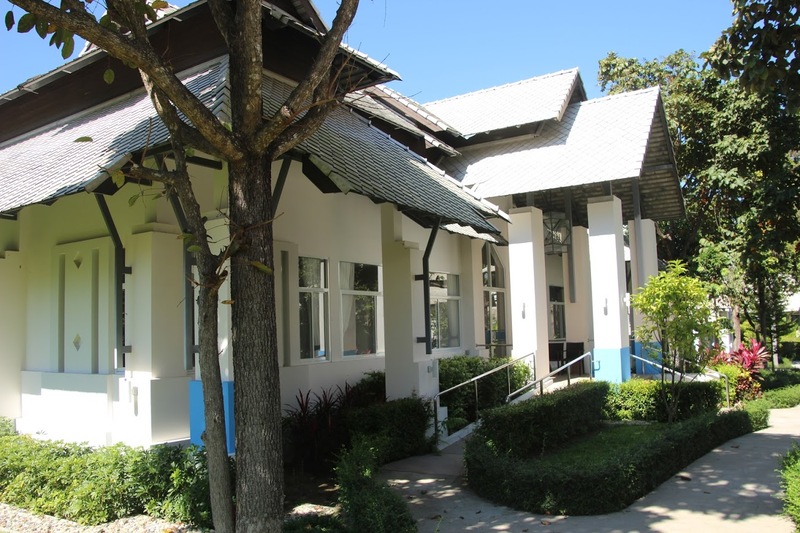 The village added a Home Stay program to encourage tourism and currently has nine homes available for visitors to stay and participate in village activities. Other income is derived from agriculture, mainly rice cultivation. The houses are built on stilts and have high ceilings to allow the cooling breezes to circulate. The accommodation is modest but clean and comfortable, with western style bathrooms. This is the perfect way to experience the friendliness of the Thai people and participate in their daily life in the countryside. All too soon we left our smiling hosts and set off towards Chiang Mai to visit a Swiss owned and managed Wellness Resort. Named Vivo Bene Village, the complex is a combination of luxury resort, retirement residence and professionally managed wellness center. The Village offers special facilities for anyone recovering from surgery, illness or simply seeking a quiet retreat. Qualified health professionals provide care for clients with special needs such as Alzheimer’s and hospice. It seems that nothing has been overlooked. Set in beautiful grounds, the residential Pavilions and Villas are tastefully decorated, each with a small kitchen for those who prefer to eat ‘at home’ rather than in the “Rossli” restaurant that serves western and Asian food, using organic vegetables grown on the property. 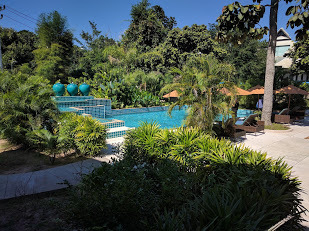 Weekly massage, laundry, meditation classes, a fitness center and a daily shuttle bus service to Chiang Mai (11 miles; 18 km) are included in the price. The terrace and pool area invite one to sit a while, enjoy the view, and sip on a glass of wine … or something stronger, if you prefer! At the end of our visit, everyone agreed that this Resort is exactly what we have in mind for our final years. Maybe we’ll have a reunion there! 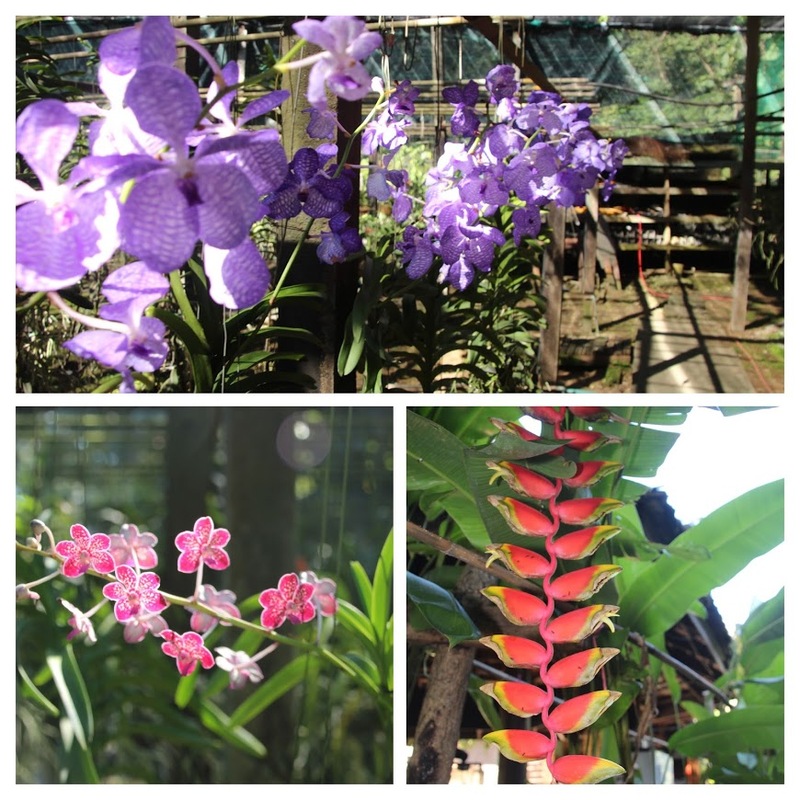 The Mae Rim Orchid Farm was a relaxing stop on this busy day. The buffet lunch was delicious and, if you enjoy orchids, you will certainly appreciate the variety of shapes, sizes and colors that you see as you stroll through the grounds.